Motivation Monday: Keep On Keeping On! It’s the fourth Motivation Monday of October on my blog today! I do apologize for my absence since last week, as other priorities demanded my time and attention. To help you recall the theme I began at the end of September, in my first Motivation Monday post for this series, I began discussing this cross-stitch piece (made by my mom-in-law) in the photo above. It contains different sayings that all essentially mean, “You can do it!” as the first line states. I decided each of the four sayings would serve as good topics for Motivation Monday posts. I don’t even know the origin of this phrase, but I know I’ve heard it numerous times during my life.The idea behind seems to be to continue doing what you’re doing, keep up the pace in the right direction, keep making the right choices, and eventually you will accomplish goals and reach your desired destination. I think this quote below addresses the meaning of it, at least in part. Patience is a tough quality to maintain! It’s interesting to meditate on the fact we don’t learn patience until we’re put into a challenging situation that requires it! 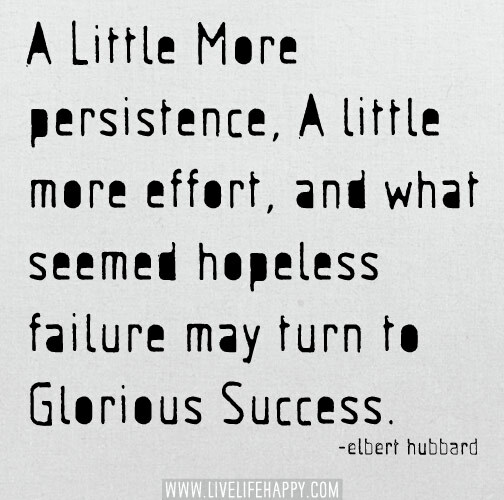 Obviously, persistence and perseverance are closely related, and are listed as synonyms to one another. However, combining all three of these, I think patience is the fuel that keeps us going, persistence is what helps us keep moving ahead, and perseverance is what pushes us across the finish line! Once we figure that out, we should be able to keep on keeping on and achieving our goals! As I shared in my other blog today, one of my most recent major accomplishments, as some may recall who have been following my blog for awhile, was successfully completing my doctoral journey after 7 1/2 years. I completed my defense of my dissertation on June 26th–just about four months ago–and officially became Dr. Karen Lee Banks! Then just last Wednesday (10-18-17), my hubby walked through the door after work with the mail…and THIS had arrived! I was QUITE ecstatic, as holding the diploma in my hands made the accomplishment seem much more real and brought closure to the journey… yet also the beginning of a new one! I can tell you quite emphatically, this 7 1/2-year journey DEFINITELY required patience, persistence, and perseverance in order to keep on keeping on, and not quit! Do you believe this quote (today’s or any of the others so far) is accurate? Have you discovered if you keep on keeping on, you usually do accomplish what you set out to do? So great Monday motivation here! thanks for the inspiration. I needed some of this motivation today. Thanks for sharing these! Love these words lady and definitely agree that perseverance is such an important part of achieving success. Everything will come to you if you work hard and keep your goals front of mind! Congratulations! This is just what I needed to read today! I needed some motivation since I feel a little down from the past week. This is something that will help me start the week right. Thank you, it’s much appreciated! A motivated Monday indeed thanks to your posts, I saw motivational quotes and I agree that you need to keep going, keep fighting. Patience is a virtue and perseverance is the key to fulfill whatever your goal is. you just need to endure the hardship. Great Monday Motivation quotes. These sure help to read to start off the week and is very inspirational. I love finding quotes that are perfect for a situation or day. Thank you for sharing these. Congratulations Karen. You are doing a great job, the post is very motivating and this is perfect for the Mondays as well as days when things are not going well. Nothing is easy and everything need work, a lot of work. Sometimesi wonder if there’s a point when it’s better to give up. These simple messages are sometimes the only phillip we need to get off our butts and get things done. Well said! I recently read Jon Acuff’s book Finish about goal setting: why so many people give up, how to make attainable goals, and how to finish your goals, etc. It really is interesting because patience, persistence, and perseverance are key! Nothing is easy! Congrats on finishing your doctoral program and finally having your degree! I know from several mentors and friends it is a long road but one well travelled! It’s a quote to help you out when you are keeping on with things that aren’t fun or easy. Repeat over and over!! this motivation is incredible, thanks for the inspiration! Great things to do take time, it is hard to get people to see that in today’s instant gratification world. But it’s always nice to have a reminder that all the hard work pays off in the end. Thank you for giving me motivation this Tuesday. I like the idea of ‘keep on keeping on’ and patience is definitely something that I need to master more that is for sure! I always enjoy reading your post – it totally reflects the title. And yes, I believe on those quote that sited. And its always better to have these perception in our daily lives. Stopping by from bloggy fifty group! These are great motivational readings. You have made my week a positive one. Keep them coming. You are doing great! Congratulations, what an amazing achievement! You must be so proud of yourself! Love your Monday Motivation. I have 4 P’s that drive me: Passion, Patience, Persistence and Perseverance. I find that all these will help me reach my goals and find success. Once again Congratulations in obtaining your Diploma Dr Karen Lee Banks! Mondays are hard so its great to have an extra boost on a Monday. Its hard to keep going sometimes, like you said, but you have to find the little things to keep you going. Its different for everyone. cant thank you enough for this! i think i can slay today! Nothing like great motivation. I love speaking positive affirmations to myself and keep moving forward, no matter what life throws my way. Congratulations on acquiring your PhD! What an amazing accomplishment!! Working hard and perseverance is what makes your goals attainable and that feeling when you accomplish your goal is unlike any other! I always use motivational quotes help me to reach my goals. Love these kinds of posts! I feel like we sometimes put too much expectation in ourselves yet not enough kind words that motivates us. I must say, after reading your post, I feel like I can slay today! Congratulations on such a major accomplishment Dr. Banks. Your quote choice is also a very good one as it’s important to also keep pushing on and moving toward your goals or dreams no matter what setbacks come along the way.